HFM is a virus, and is contagious. It's always a good idea to be sure there is as little interaction between someone with HFM and other friends and family during this time (easier said than done). It may be best to wear clothing to cover the areas where sores are viewable, to hopefully cut down on exposure to others. It also might be a good idea to diffuse an anti-germ blend to combat airborne germs during this time. 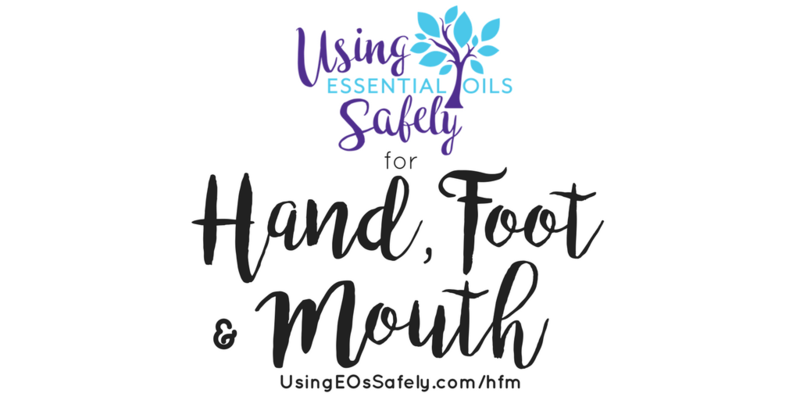 Lea has a recipe that is safe for all ages here: Using Anti-Germ Essential Oils Safely. Like any virus, the sick one should consume immune-boosting herbal teas and lots of water. Elderberry syrup is my #1 suggestion for viruses, as it has been shown to reduce symptoms and length of illness. You can make your own following Lea's recipe over on our Colds page. Tea Tree is safe for all ages and effective for both the virus itself, as well as reducing pain and soothing the itch. Aloe Vera Gel makes a great carrier, as it is soothing as well. It is not recommended to using a roller bottle to apply, as we want to to prevent spreading. It's best to dip a Q-tip in bottle of the mixture and apply to the sores that way (no double-dipping!). The Bug Bite Soother recipe can be useful for this need.